7. Whatever happened to socialism? The siege of Kobani by the Islamic State (IS) and its tenacious defense by mostly Kurdish forces brought international attention to the Syrian Kurdish PYD (Partiya Yekîtiya Demokrat, Democratic Union Party). The PYD is the leading Kurdish force in a large part of northern Syria where it has strong influence in three enclaves, or ’cantons’, of Kurdish-majority areas. In November 2013 it declared in these cantons the transitional administration of ’Rojava’ (Western Kurdistan). The stated goal of the Rojava project is to build a liberated, democratic society with equal rights for women in which different ethnic and religious groups can live together. The ideological inspiration for this project is the thought of the Turkish Kurdish PKK and its leader Abdullah Öcalan. In the early to mid nineties the PKK led a fierce guerrilla-war against the Turkish state and it remains a significant force in itself and through its influence over other organizations. Initially, the PKK followed a ’marxist-leninist’ ideology. However, the movement underwent deep ideological changes, especially after Öcalan’s capture in 1999. The PYD denies any organizational links with the PKK but it was set up by Syrian PKK-members and claims to follow the same ideology as the current PKK. This article examines this ideology and its changes in several key aspects. The first two parts discuss the early strategic orientation of the PKK and its similarity to other national liberation movements of the time. Part three discusses the idea of ’creating a new man’, an idea that became central to the PKK’s conception of the future society they struggled for. This idea was a distinctive characteristic of the PKK. It is not unusual for activists in this movement to describe their political convictions as ’the ideology of Öcalan’ and part four discusses the role of Abdullah Öcalan as the leader and ideologue of the movement. Part five discusses another distinguishing characteristic of the PKK : the role that it sees for women and women’s liberation in social change. Part six and seven deal with the changing ideas of the PKK about the future society : its vision of a ’democratic civilization and its changing conception of ’socialism’. Because of his dominant role as both the leader and ideologue of the movement, the article will give extensive attention to statements and writings of Öcalan himself. The current Kurdish liberation movement in Turkey has its roots in the radicalization of the sixties. After a coup by ’progressive Kemalist’ army officers in 1960, a new Turkish constitution was introduced that promised the right to work, a minimum wage, the right to strike as well as freedom to organize. In this atmosphere, trade-unionists and progressive intellectuals organized the ’Workers Party of Turkey’ (Turkiye Isci Partisi, TIP), a party that in 1965 won three per cent of the vote and 15 seats in the parliament. The TIP was a reformist party that re-introduced socialist ideas that had been made taboo and even outlawed by the Kemalist state. The TIP condemned the militant actions of radical-left youth activists and had only shallow roots among the working class. However, the TIP did have relatively strong support among Turkey’s Kurds. The Kurdish provinces of Turkey have always been the poorest part of the country, partly the result of racist state policies that discriminated against the Kurds. Speaking Kurdish was a crime, use of the letters x, q and w – which exist in the Kurdish alphabet but not in the Turkish – could be prosecuted, publications that simply mentioned the word ’Kurd’ were banned and the Kemalist state tried to assimilate the Kurdish minority into the Turkish majority. In the late sixties, a number of Kurdish members of the TIP started to discuss the specific problems of the Kurdish population in the country. Out of these discussions grew the Revolutionary Eastern Cultural Hearts (Devrimci Doğu Kültür Ocakları, DDKO). The word ’Eastern’ was an euphemism to avoid state-repression since any discussion of even the existence of Kurds was banned. Simultaneously, Turkey saw the growth of a new, militant Left. In 1965 the Federation of the Revolutionary Youth of Turkey (Turkiye Devrimci Genclik Federasayno or Dev-Genc) was formed. Dev-Genc members organized university occupations, protested against the presence of US-troops, organized solidarity with workers’ protests and fought fascists on campus and in the streets. Parts of the workers movement also radicalized and 1967 the Confederation of Revolutionary Trade Unions of Turkey (Türkiye Devrimci İşçi Sendikaları Konfederasyonu, DİSK) was formed as a left alternative to the established trade union federation. Workers also organized wildcat strikes and factory occupations, peasants occupied land. Out of this ferment and radicalization the first armed groups grew in the early seventies. Inspired by the Cuban revolution and Maoism, these groups saw Turkey as a ’neo-colony’ of the US and considered themselves to be fighting for a ’national-democratic’ revolution that would break the grip of imperialism on the country, bring true national independence and open the way for a second, socialist stage of the revolution. Abdullah Öcalan began his political life in these radical-left circles. Born in 1949 as a son of a poor peasant family, Öcalan grew up in a very religious and conservative environment. In 1966, he went to Ankara to attend a vocational school that trained students to work in the state’s land registry offices. In 1969, he graduated and found work, first in Diyarbakir and after a year in Istanbul. Shortly before graduating, Öcalan had become interested in politics and started to visit political meetings. Öcalan joined the DDKO and protests of the radical youth. In 1971 the army staged a new coup, now to stamp out the radical movement. The TIP was banned and the DDKO closed down as many activists fled the country. In 1972 Öcalan, who by that time had begun to study political science in Ankara, was arrested during a protest in solidarity with Turkish leftists who had been in killed in a firefight with the police. Öcalan was sentenced to seven months and found himself in the military prison Mamak in the company of Dev-Genc leaders and other experienced radicals. His arrest radicalized him further and the political discussions he witnessed in jail made a strong impression on him. He decided to dedicate himself fully to radical politics. After his release from jail, the coup regime had successfully repressed many of the radical groups. Öcalan didn’t feel at home in any of the existing groups, either Kurdish or Turkish. The Turkish radical-left, more or less under the influence of Kemalist nationalism and the theory of a revolution by stages, tended to neglect the oppression of the Kurds or even denied this was an issue. Such groups reasoned that since Turkey itself was an oppressed nation, the Turkish state was incapable of imperialist policies like national oppression of the Kurds. If they did recognize there was oppression of Kurds specifically, many Turkish leftists saw this as an issue that could be dealt with only after a national-democratic revolution that would liberate Turkey from imperialism. In 1975 the traditional Kurdish nationalist movement suffered a heavy blow with the defeat of the guerrilla-war in Iraq led by Mullah Mustafa Barzani (father of the current president of the Iraqi Kurdish region, Massoud Barzani). Barzani had allied with the US, Israel and Iran against the Iraqi state but was abandoned by his allies after Baghdad made concessions to Tehran. Öcalan drew the conclusion that the Turkish Left could not be the champion of the Kurds and neither could this be traditional nationalists like Barzani who looked for support abroad. The Kurds would have to fight for themselves, as Kurds. Öcalan started to build his own group that adopted the notion of pioneering Turkish sociologist İsmail Beşikçi that ’Kurdistan’ was an international colony, occupied by Turkey, Iran, Syria and Iraq. From 1975 on, Öcalan’s group started to agitate under the name Kurdish Revolutionaries (Soresgeren Kurdistan, SK). Its core members often resembled Öcalan : young Kurds from a poor, rural background that had radicalized as students. This was a very different layer than that of the wealthy family of Barzani or the urban students that played an important role in the Turkish Left. The SK was not exclusively Kurdish but also included a number of Turkish leftists who saw the liberation of Kurdistan as a precondition to revolution in Turkey. Unlike other Left groups, the SK decided not to spend resources on publications, instead recruiting people through intense one-on-one discussions. Its recruitment focused on poor, often illiterate Kurds, often from a rural background who had moved to the cities to look for work. Another characteristic of the SK was its willingness to use violence against groups like the fascist Grey Wolves. This brought the SK a certain respect and attraction to radical youth which helped make up for the lack of a well-known leader or financial means. This militancy appealed to many Kurds who had recognized that the Turkish state would not allow the Kurds to free themselves through non-violent means and who, after the defeat of the traditional nationalism of Barzani, were looking for an alternative. A few years later, the SK had won modest support in several of the bigger cities of the Kurdish regions. In 1977, the group was reorganized as the Kurdish Workers Party (Partiya Karkeren Kurdistan, PKK) and adopted a manifesto. This manifesto, ’The Road of the Kurdish Revolution’ strongly resembles statements of other ’marxist-leninist’ national-liberation movements of the time. In 1977 its first party program, which largely summarizes the ideas in the manifesto, was drafted. The revolution will take the form of a prolonged armed struggle or ’people’s war’, based on the peasantry. The leadership of the revolution has to be ’the working class’, led by the PKK. The power of the ’feudal’ leaders of Kurdish society needed to be broken since these are the representatives of colonialism. The peasantry and the urban petty bourgeois are the two main allies of the working class. There is no Kurdish ’national bourgeoisie’ because colonialism did not allow such a class to develop. International allies of the revolution are ’socialist countries’, working class parties of capitalist countries and ’the liberation movements of oppressed peoples of the world’. Its enemies are the Turkish state, its ’native feudal-collaborators’, and ’the imperialist powers behind them’. After the ’national-democratic’ revolution, the struggle will, ’without interruption’, proceed in a socialist revolution. This manifesto, and the party symbol, a red flag with the hammer-and-sickle, would be in place until the fifth party-congress in 1995. The documents are obviously heavily influenced by Maoist ideas but do not adopt the designation of the Soviet-Union as ’social-imperialist’. The ruling parties of the Soviet-Union and China are both criticized as implementing ’revisionist’ policies. Overall the ’really existing socialist countries’ are considered allies of the Kurdish revolution, but none of their governing parties is accepted as an ideological lodestar. PKK-ideologue Mehmet Can Yüce later mocked Turkish left-wing groups that were looking for a ’Mecca’ in Moscow, Tirana or Peking. The PKK was not the only Kurdish leftist group to adopt such a framework at the time, nor was it the only one to declare armed struggle a necessity. In fact, several other Kurdish groups at the time, like the Vanguard Workers Party of Kurdistan (PPKK—Partiya Pêşenga Karkerên Kurdistan) and Socialist Party of Turkish Kurdistan (TKSP, known as Özgürlük Yolu, Freedom Path) had more support at the time and made similar declarations. The PKK first began to move against the traditional Kurdish elite, aghas - the ’feudal’ landlords that with the aid of their supporters controlled whole villages and often closely cooperated with the Turkish state. The PKK fought on the side of rebelling peasants and lost dozens of members in clashes with the militia of landlords. The guiding principle in choosing its targets was for the PKK however not social antagonism, but the politics of the aghas : whether they opposed the national movement or not. At the same time, various Turkish leftist and Kurdish groups fought among themselves ; ’the PKK was initially relatively insignificant among [rival organizations] and only became known because it was the most violent’. During fighting between different radical groups, dozens were killed. The PKK was both initiator and victim of such violence. When in 1980 the army staged yet another coup, the PKK had become the strongest Kurdish party in Turkey. After the coup, tens of thousands were arrested. The Turkish Left, that in the previous years had again grown to a significant force, was largely unable to withstand the repression. At the end of 1983, there were still 40.000 political prisoners that were routinely brutally tortured. Among the prisoners were thousands of PKK-supporters and members. Many of them continued the struggle inside the prisons, undertaking ’deathfasts’ that claimed the lives of leading members or committing suicide in protest. The dead became important martyr-figures for the movement and their sacrifices reinforced the reputation of PKK-members as unyielding revolutionaries. Öcalan himself escaped the repression ; shortly before the coup, he had gone to Syria and from there he went to Lebanon. In Lebanon, he made contact with the Democratic Front for the Liberation of Palestine (DFLP) and later other Palestinian groups like the Popular Front for the Liberation of Palestine and Fatah. Abu Laila, a leader of the DFLP, later said of Öcalan ; ’We had met other Turkish Kurds and they didn’t seem to be very reliable. This man seemed to be serious. He didn’t want [military or financial] assistance...he only wanted to send volunteers...to be trained for the future’. ’These people turned out to be really serious, real fighters, real soldiers. It was clear he [Öcalan] had some popular base in Kurdistan.’  The Palestinians provided valuable military and organizational training to the Kurds, but the PKK members received their ideological training separate from the other groups. The PKK joined the Palestinians in the fight against the Israeli army when it invaded Lebanon in 1982. A few years later, the PKK launched its people’s war. Öcalan had established contact with the Syrian regime and was allowed to base himself in Damascus. The PKK opened a training camp in a Syrian controlled part of Lebanon. In 1982, the PKK reached an agreement with the major Kurdish rebel group in Iraq, Barzani’s KDP, that allowed them to set up camps near the Turkish border. The PKK started small-scale armed actions in Turkish Kurdistan and agitation among the rural communities in the border-area. Its first large action took place in 1984 when it attacked several army barracks and temporarily took control of some villages. PKK-fighters distributed statements declaring their goal was ’the struggle of our people for national independence, a democratic society, freedom and unity, under the leadership of the PKK, against imperialism, Turkish colonial fascism and its local lackeys’. At the same time, the PKK appealed to ’revolutionaries and the working people from Turkey’ ; ’every blow of the HRK [the armed wing of the PKK] against colonial fascism is a blow against fascism in Turkey’. However, cooperation between the PKK and the Turkish radical-left was very difficult. The military coup had decimated the Turkish Left and the PKK tried to dominate any alliance, reasoning that the Turkish Left had proven to be incapable of leading a revolution. In turn this drove away potential allies. The PKK’s theory of revolution at the time was heavily influenced by the Maoist conception of protracted people’s war. In this strategy, the armed struggle is the primary means to seize power. The armed struggle is based in the rural countryside and the majority of the fighters are recruited from the peasantry. The struggle is led by the party that supposedly represents ’proletarian’ leadership and is supposed to keep socialism as a goal, although the strategy first aims at a ’national-democratic’ stage. The people’s war starts with small guerrilla attacks and proceeds through different stages of escalating warfare, from a ’strategic defense’, in which the rebels are limited to small scale hit-and-run attacks, to a second stage, during which the government forces are pushed on the defensive while the party expands its political influence. In the final stage, the guerrilla has gathered enough forces and weapons to move to conventional warfare and engage the enemy in decisive battles. Until the mid-nineties, Öcalan and the PKK referenced this strategic framework with an independent Kurdistan as its goal. Two elements that distinguish the early PKK from like minded movements were its evaluation of the history of the Communist International and of the relation between the party and the guerrilla-army. Already in its early documents, the PKK severely criticized the Soviet-Union of the early twenties and the Comintern for its critical support to Kemalism. In early 1920 Mustafa Suphi, founder of the Turkish Communist Party TKP, and a dozen of his comrades were murdered by right-wing nationalists. The massacre happened with at least tacit approval of Mustafa Kemal Atatürk but that did not stop the signing of the Treaty of Brotherhood between the Grand National Assembly of Turkey under the leadership of Atatürk, and the Soviet-Union on 16 March 1921. PKK statements criticized the early TKP and the Comintern not only for having illusions in the democratic potential of Kemalism but also accused the Comintern of ignorance of the local situation and the Soviet leadership of prioritizing the national security of the Soviet-Union over internationalist and anti-imperialist principles. Such a critical view of the early Soviet-Union was not shared by many ’marxist-leninist’ parties that tended to regard Soviet statements as holy writ. Later, after the implosion of the Soviet-Union, the PKK would attempt to formulate a more exhaustive critique of the Soviet ’model’ but this remained rather superficial : it blamed the defects in democracy on faulty decisions of the leadership and the prioritizing of state-interests over those of its citizens but did not explain why such errors could become policy for decade after decade. Kalkan touches upon the most distinctive element of PKK-thought of the eighties and nineties ; its ambition to create a ’New Man’, characterized by a certain personality. The theme of the ’personality’ of the Kurds appeared already in Öcalan’s texts in the early eighties and remains a prominent part of it. According to Öcalan there is a metaphysical ’Kurdish mentality’, a certain ’composition of the Kurdish psyche’. Öcalan still claims ’many of the qualities and characteristics attributed to the Kurds and their society today can already be seen in the Neolithic communities of the cis-Caucasus mountain ranges - the area we call Kurdistan’. However, the Kurds have been alienated from their ’true’ identity by the attempts of the Turkish state to assimilate the Kurds and by the traditional social structures, what Öcalan calls ’feudalism’. In a 1983 text, ’On Organization’, Öcalan discussed the role of the political organization, citing Marx, Engels, Lenin, Giap and Che Guevera. Like other texts by the PKK and Öcalan at the time, most of it is very similar to the rest of the Kurdish and Turkish radical left but ; ’the substantial and distinctive part of the argument in this work is concerned with the “reorganization of the whole society”. Rather than structuring a ‘Marxist-Leninist party of the working class’, an overall reorganization is proposed because Kurdish society has been the victim of a “deliberate disorganizing program from top to bottom implemented by the Turkish colonialists”’. Re-organizing Kurdish society ’from top to bottom’ would require building a new Kurdish identity and person-hood. Gradually, notions like ’humanization’, ’socialization’ and ’liberated personality’ replaced marxist notions of classes and class-struggle. When in Öcalan’s recent writing names of classes still appear, they function as synonyms for political opponents (feudal for Kurdish clan-leaders, petty-bourgeois for non-PKK Kurdish groups) whose determining characteristic is often their ’distorted’ or ’sick’ personalities. Time and time again, Öcalan attacks the ’diseased’ personalities of people who disagree with him. The creation of the new man played a central role in the critique the PKK tried to formulate of ’really-existing socialism’ after its collapse and of the new vision of socialism it tried to elaborate. The PKK did not regret the collapse of the Soviet bloc ; ’we mourn the collapsed not so much, because we rather experience the relieve from a burden’, Öcalan stated in 1992. The 1995 program defined ’really existing socialism’ as the ’lowest and most brutal stage of socialism’, and explains its defects as such ; ’in the ideological aspect a descend into dogmatism, vulgar materialism, and great-Russian chauvinism ; in the political aspect the creation of an extreme centralism, the freezing of democratic class struggle and raising the interests of the state to be only decisive factor ; in the social aspect the restriction of the free and democratic life of society and the individual ; in the economic aspect the dominance of the state sector and not overcoming a consumption society that emulates foreign countries ; finally in the military aspect the prioritizing of the army and weaponry over all other fields’. The way the PKK thought these failings could be avoided by a new socialism was by building the new man. In the mid-nineties, the PKK emphasized its differences with really existing socialism as it tried to formulate its own distinctive ideology. In 1993, Öcalan claimed that the PKK, when it discussed ’scientific socialism’ did not refer to marxism but to its own peculiar ideology of a ’socialism’ that supposedly ’exceeds the interests of states, the nation and classes’. Symbolically, the 1995 congress removed the hammer and sickle from the party flag ; ’the hammer and sickle in really existing socialism only involved the class of workers and peasants, and is with this also an expression of really existing socialism. The new conception of socialism is about the whole of humanity’. The claim to be fighting for ’the whole of humanity’ remains a frequent trope in PKK and PYD statements. The idea of people ’remoulding’ their personalities to become revolutionaries is not unique to the PKK. In the maoist Communist Party of the Philippines it was a recurring theme that to become truly proletarian revolutionaries, members had to ’remould’ themselves to lose so-called ’petty-bourgeois’ habits. But the PKK went much further : people were not only expected to become good party-members but to change their whole personality. The idea of creating a new man brings to mind Che Guevara’s writing about socialism and human personality or the Soviet discourse about the socialist new man. The crucial difference is that the PKK claimed to be creating this new man already before revolution, and that through sheer determination and hard work, the socialist ’superman’ would be created in the bases of the PKK. It was not only socialism as a social-economic system that was gradually pushed aside by this socialism of the new man. Something similar happened in PKK statements about Kurdish self-determination. In the second half of the eighties, the PKK would mention less and less the goal of a ’independent and united Kurdistan’, instead talking about a ’Free Kurdistan’, a formulation that leaves more ambiguity about the political goal. Terms like ’freedom’ and ’independence’ were used more and more to talk about individual, ’spiritual’ goals, referring to this new personality, instead of to statehood. This theme became especially strong in Öcalan’s statement before the court in 1999, partly published as ’Declaration on the Democratic Solution of the Kurdish Question’ and in the prison writings. In these texts, Öcalan claimed that already before his imprisonment he used terms like ’freedom’ and ’self-determination’ mainly to refer to individuals, and not peoples. He even claimed that the PKK was never secessionist, a statement that contradicts the vehement insistence from 1978 that anything less than an independent Kurdistan (specified to be under occupation from Turkey, Iran, Iraq and Syria) would be betrayal. Despite the other ideological renovations, the 1995 program insisted that an independent Kurdish state was the final goal of the movement. In the eighties, Öcalan consolidated his control over the movement. After a power struggle in the early eighties, which ended with the death or flight of his rivals, ’Apo’, a diminutive of Abdullah and meaning ’uncle’ in Kurdish, consolidated his control over the organization. Officially the chair of the party, Serok Apo (leader Apo) became not only a political leader but also the military commander, the movements’ ’philosopher’ and a prophet-like figure. ’One person represents the new upright posture, practically the resurrection of a nation. My role is indeed that of a prophet, speaking to an enslaved, mercilessly oppressed people’, Öcalan declared in 1992 ; ’we have to fight for our freedom ourselves. I symbolize this fight’. The ideological publications of the PKK consist almost completely of texts by Öcalan. Only a few other prominent figures of the party published books and those are often memoirs. At party meetings, Öcalan would deliver speeches, without notes, that lasted for hours and were then transcribed and published as books, even telephone conversations were recorded to be ’studied’. In PKK jargon, Ocalan’s statements are known as ’analyses’ (çözümlemeler). Opposition to Öcalan and his decisions was impossible and the PKK would pay a heavy price for this as its fortunes on the battleground declined. In the late eighties and early nineties, the Turkish army was gaining more experience in fighting against guerrillas, using sophisticated equipment like Israeli supplied night-vision goggles and US combat helicopters. In addition, the Turkish state viciously targeted civilian supporters of the PKK and of Kurdish rights in general. Between 1984 and 1999 up to 40.000 people were killed. According to the Turkish army, they lost almost 6500 soldiers until 2008 and killed 32.000 PKK-members but those figures are not credible. According to the PKK, their losses were much smaller but the total number of casualties of the conflict must be much higher. Both sides, but overwhelmingly the Turkish state, targeted civilians suspected of aiding the enemy. Jandarma İstihbarat ve Terörle Mücadele (JİTEM), a branch of the Turkish gendarmerie that officially did not even exist, was according to the Turkish Human Rights association IHD involved in 5.000 unsolved killings of journalists, intellectuals, human rights and political activists, and responsible for 1.500 ’disappearances’. Turkish intelligence services also cooperated with right-wing and islamist militia that made thousands of casualties, most of them civilians. In the late eighties, the Turkish army started to forcibly remove Kurdish villagers to separate the guerrillas from civilian supporters. Estimations of the number of people displaced vary from 275.000 to 2 million. With much of its civilian support removed in this way, and under increasingly heavy attack, the PKK started to suffer military setbacks in the mid-nineties. But Öcalan refused to listen to warnings from field-commanders and insisted they should go on the offensive. A 1994 statement claimed ’the struggle which the PKK carries out has left the stage of strategic defense [. . . ]. It is inevitable that we escalate our struggle in response to Turkey’s declaration of all-out war.’ Setbacks were not blamed on the faulty instructions from ’the leadership’ but on the failure of commanders to correctly carry them out. Flach described ’criticism and self-criticism’ sessions she witnessed in this period ; ’failures were seen primarily in the personalities of the commanders and the fighters. Structures from the old life [before the guerrilla] are still lived, feudal or petty-bourgeois attitudes and views are not superseded and exactly this is seen as the most important obstacle to implementing the ideas of the party’. But the validity of these ideas themselves was not put into question. The PKK’s idea of creating a ’New Man’ was a powerful means of control as the ideal incorporated unquestioning obedience - and criticism of the ’leadership’ was seen as proof of failing to achieve this goal. Öcalan was more than a distinguished or even indispensable leader, he himself, his person, was built up to be indispensable to the liberation of the Kurdish people. As a critical observer noted his role ; ’he alone “is” the key to liberation – as opposed to just possessing it’. This also explains why even after his capture Öcalan remained the leader of the movement. In 1998 Turkey threatened Syria with war if it continued to shelter the PKK leader. The Syrian regime ordered Öcalan to leave and in October 1998 he left the country. For 130 days Öcalan went from country to country looking for asylum. He intensified his calls for a political settlement and declared the PKK would accept a ’democratic republic’ ; a united Turkey that would guarantee freedom of speech for the Kurds and recognize the presence of a Kurdish minority. Öcalan said the PKK was ready to lay down arms of those conditions were met. In February 1999 Öcalan was captured by Turkish agents. Already in its first program, the PKK called for full equality of men and women in all social and political aspects, but this was little more than one clichéd demand among others, just below introducing the eight hour workday, if possible. The same program declared the national oppression of the Kurds to be the ’main contradiction’ that the party should fight against. In 1987, the party organized the ’Union of Patriotic Women of Kurdistan’ (Yekitiya Jinen Welaparezen Kurdistan, YJWK). Like the women’s organizations of many other marxist-leninist parties, its original intention was facilitating the participation of women in the party, but it was also to provide a space to deal with specific women’s issues. Today, it is in the field of women’s liberation and gender equality that the PKK movement takes its most radical positions. One of the aspects that sets the struggle of the PKK apart from other Kurdish rebellions is the large participation of women in all levels of the movement. In a way, the category of ’women’ has replaced that of ’the international proletariat’ in the PKK ideology : today it is women as such who are assumed to be the vanguard of the struggle. The movement declared that its goal is not just the liberation of Kurdish women but of women worldwide. The PKK’s ideas on women’s liberation are heavily influenced by the myth of a prehistoric matriarchal past during the neolithic, ’when the woman was a creating godess’ (Öcalan). With the rise of class society, the oppression of women began. These notions are clearly taken from Friedrich Engels’ ’The origin of the family, private property and the state’. The liberation of women was and is seen as part of the liberation of the Kurdish people, but there has been a shift in how this relationship is conceived. In her article ’From Kawa the Blacksmith to Ishtar the Goddess : Gender Constructions in Ideological-Political Discourses of the Kurdish Movement in post-1980 Turkey’, Handan Çağlayan summarizes this change as one of talking about women, an instrumental view of seeing women as a resource for the revolution, to one of talking to women as actors in their own liberation. This shift took place in the second half of the nineties. In the early nineties, the participation of women inside the PKK, including in its guerrilla units, increased dramatically. In these years, large protests broke out among the Kurdish population, the Serhildan, also sometimes known as the Kurdish intifada, that were fueled by a new sense of Kurdish identity and strength that had been made possible by the armed struggle. These protests involved layers of the population that were not in direct contact with the PKK guerrilla’s units in the mountains but nevertheless sympathized with them. Especially the Newroz (Kurdish New Year) celebrations of 1990, 1991, and 1992 were important as they turned into confrontations with Turkish security forces. Women participated massively in these protests, confronting security forces in the streets. The protests were repressed but in their aftermath, the Kurdish movement became a truly popular mass movement, involving student organizations, cultural associations, publications, women’s groups and other initiatives. The PKK was the hegemonic force in this movement but at the same time struggled to integrate the many new recruits that often came from very different social backgrounds than the old guard. Dozens of these often young, educated volunteers were executed by PKK commanders who mistrusted them or felt that their power was being challenged. But the influx of new members did change the party. As the participation of women in the guerrilla increased, the movement was forced to confront persisting sexist ideas and practices. Women refused to have their roles in the movement limited to that of providing support, instead choosing to fight as part of the guerrilla. The new role of women led to changes in the ideology and organization of the PKK. In the guerrilla, independent women’s units were formed and later an independent women’s army – a practice that was also adopted by the Syrian Kurdish movement when it organized the YPJ (Yekîneyên Parastina Jinê, Women’s Protection Units). The motivation is that in this way women are freed from the sexist practices of male comrades and at the same time forced to break with traditional notions of female obedience and servility and instead assume leadership roles. The same principle was applied in the political organizations. In 1994 the Free Women’s Movement of Kurdistan, later renamed as Free Women’s Union of Kurdistan (YAJLK), was formed. After Öcalan’s capture, the organization was dissolved and later reformed as the Party of Free Women (PJA). In all mixed PKK-organs a mandatory gender quota exists. The leaderships have to include at least 40 per cent women, executive posts are double functions of one man and one woman. The PYD for example has two chairs : Salim Muslim and Asya Abdullah, who stayed in Kobani during the siege. Again, the PKK’s idea of creating a new man, and a new woman, proves to be a powerful ideological tool. An important difference between the PKK’s theory of women’s oppression and liberation and that of Friedrich Engels is their neglect of social-economic factors. Engels argued that with the rise of social classes came a division of labor that relegated women’s labor, and hence their social status, to a secondary position. In the PKK, the emphasis is instead (again) on issues like ’mentality’ and ’personality’ ; women’s oppression is supposedly rooted in patriarchal attitudes that are transferred from generation and that are internalized by women. To liberate themselves, women need to unlearn these attitudes just as much as men, and this way men and women are created anew. The PKK’s thinking is strongly essentialist. Women and nature are often equated, and following this, ’woman’ is identified with motherhood. Women are assumed to have certain characteristics as women, such as empathy, an abhorrence of violence and a closeness to nature. These qualities need to be taught to men so that patriarchal society can be overcome. These ideas put a heavy burden on women. On the one hand, the traditional family is criticized as a space in which patriarchal attitudes oppress women and as an institution through which the Turkish state and feudal rulers dominate the Kurdish people. On the other hand, the family is seen as the cradle from which a new Kurdish society should be born since the family plays such an important role in socializing people, in ’creating personalities’, and this is at the center of the PKK’s vision of liberation. Thus it is women, as mothers and educators, who are given a primary responsibility in deciding the outcome of the struggle. Women are considered to be in the vanguard of the liberation struggle but to be able to play this role, they first have to liberate themselves from what is called their ’slave mentality’. Setbacks for the movement become then the responsibility of women who have failed to play their role. Liberation and the ’top to the bottom’ reorganization of Kurdish society that the PKK set itself as a goal are now considered to be impossible if women are not liberated and in fact, it is women who should play a pioneering role in this social transformation. The PKK started to develop its own peculiar ideology in the late eighties and in the mid-nineties a number of ideological inventions had become part of the official policy. After his capture however Öcalan would accelerate the PKK’s ideological metamorphosis. In the hands of the Turkish state, Öcalan started to make statements from jail through his lawyers. He praised his prison conditions and called on the PKK to hold on to the cease-fire it had declared the previous September and declared that negotiations with the Turkish state would continue – through him personally. Öcalan’s subsequent statements before the court came as a shock. Öcalan drastically reinterpreted the history and the ideology of the PKK. In court, Öcalan expressed regret over the death of Turkish soldiers and when the court asked if it would be correct to transcribe his words as an apology, he did not disagree. Öcalan did not mention the suffering of the Kurds but did find time to praise Ataturk, the founder of the Turkish republic, and referred to the cooperation of Kurds and Turks in the independence war in the early twenties. He claimed that if only Ataturk’s ideas had been faithfully followed, there would have been no ’Kurdish question’. An ideologeme that recurs since the ’Declaration on the Democratic Settlement’ is that of ’democratic civilization’, which the PKK now declares to be its goal. In this text, Öcalan explained he took the term from a 1964 book by US sociologist Leslie Lipson : a study of the development of the parliamentary system in western societies. In his recent prison writings, the term takes center-place, now without being credited. What exactly this ’democratic civilization’ is for Öcalan remains unclear. But it is clear Öcalan, at the latest beginning with the ’Declaration on the Democratic Settlement’, became an admirer of western parliamentary democracy. In it he repeatedly refers to it as a model for Turkey. The statement contained long quotes from Lipson describing the political system of Switzerland which Öcalan used as an example of how in a single country, different social-cultural groups can live together. According to Öcalan, this could be an example for Turkish-Kurdish co-existence in a single state. Later, Öcalan became an enthusiastic supporter of Turkey joining the European Union, hoping this would force Turkey to introduce democratic reforms that would bring closer the ’democratic republic’. The democracy Öcalan praises is often equated with the parliamentary, capitalist states of the West : he claims that in European countries a ’determined democracy’ developed and that this led to the ’supremacy of the west’, ’Western civilization can, in this sense, be termed democratic civilization’. What Turkey and the Kurds needed was ’Western-style problem solving’. And in 2011 ; ’In principle, the western democratic system – which has been established through immense sacrifices – contains everything needed for solving social problems’. ’Europe, its [referring to ’democracy’] birthplace has by and large left nationalism behind in view of the wars of the twentieth century and established a political system adhering to democratic standards. This democratic system has already shown its advantages over other systems – including real socialism – and is now the only acceptable system worldwide’. In his court statements, Öcalan presented the most intensive phase of the war as a mishap ; ’Turkey failed to have a democratic system due to a lack of conviction, serious efforts and a true understanding of democracy (as opposed to demagoguery)’ and this led to the outbreak of armed resistance. But, Öcalan stated, the PKK’s armed struggle in the nineties was wrong ; ’In Turkey in the nineties, together [for Kurds and Turks] there were positive developments in human rights. After this the uprising was wrong. There was a way of solving the problem’. Here Öcalan was talking about the period in which he, as absolute leader of the movement, had ordered the PKK to go on the offensive and branded cadres who wanted to shift attention away from the armed aspect of the struggle as traitors. After the capture of Öcalan, the PKK-presidium declared that he is ’our leader but he is captured. His directions are no longer binding’. For an underground movement, this was a common sense statement to make but the PKK quickly made a u-turn ; in July an enlarged meeting of the central committee adopted Öcalan’s defense plea as the new party manifesto or ’Second Manifesto’. In their book ’PKK. Perspektiven des kurdischen Freiheitkampfes : Zwischen Selbsbestimmung, EU und Islam’, Nikolaus Brauns and Brigitte Kiechle write ; ’Öcalan’s authority was so great, that the PKK presidium, whether it liked it or not, had to take this step if it didn’t want to lose its influence over the party or even be branded as traitors.’  Captured or not, Öcalan remained the önderlik. Öcalan’s new orientation, now made party policy, was unacceptable even for many previously loyal followers of Apo. Thousands left the movement. A small number of PKK-leaders unsuccessfully opposed the new orientation and the end of the armed struggle that was officially adopted at the PKK’s seventh congress of February 2000. Leading figures like like Meral Kidir, general secretary of DHP (Revolutionary Peoples Party), an off-shoot of the PKK, and Mehmet Can Yüce criticized the new orientation from the jails were they were held by the Turkish state. A DHP statement responded by declaring ; ’Liquidation and provocations, which were all smashed until today, cannot succeed. The fate of provocations and liquidation which is imposed will be the same.’ After the seventh party-congress, Serxwebun threatened the dissidents with the ’most severe punishment’ under ’conditions of war’. The dissidents were unable to formulate any other alternative except a continuation of the failed people’s war strategy and were quickly sidelined. As a sign of goodwill, Öcalan ordered the PKK guerrillas to withdraw from Turkish territory. Many of them were killed as the Turkish army attacked the retreating fighters. In the period 1999 - 2005, the PKK was in shock, grappling with Öcalan’s capture and trying to re-organize without the Serok and in accordance with his new instructions. Since the Second Manifesto, even though he is depended on his jailers for information about the outside world, Öcalan continues to make authoritative ideological statements. In these statements, Öcalan often returns to the mythical past. Öcalan claims the PKK’s struggle is only the latest Kurdish rebellion against centralized state-power. In a remarkable example of ’auto-orientalism’, the Kurds are presented as a people without history that since Sumerian times (4th millennium BCE) have rebelled against state-power, all the while remaining ’at essence’ the same. The ’original sin’ that caused their oppression was the formation of the state as such, against which the Kurds tried to preserve their ’natural’ free culture. Öcalan describes his goal as a ’renaissance’ of the idealized society that during the Neolithic supposedly existed in what is now Kurdistan. In a kind of Aufhebung, the positive aspects of this mythic past – a central role for women in society, a ’pure’ Kurdish identity, social egalitarianism – are to return in a modern form and become a guiding example for the entire regime. This renaissance is supposed to be realized in three intertwined projects : democratic republic, democratic autonomy and democratic confederalism. The ’democratic republic’ entails a reform of the Turkish state. Similar to the kind of statements Öcalan was making in the years before his arrest, the call is for Turkey to recognize the existence of minorities, especially Kurds, among its population and to dissociate citizenship from the Turkish ethnicity. This theme is prominent in Öcalan’s defenses for the court. Democratic autonomy is a concept borrowed from Murray Bookchin (1921 – 2006), a US libertarian socialist and theoretician. After a brief period as a Stalinist in his teenage years, Bookchin joined the Trotskyist movement in the late thirties and became a member of the Socialist Workers Party. Like many trotskysists, Bookchin had expected the Second World War to end with a wave of social revolutions, led by the working class, in which trotskyists would play important roles. When this did not happen, and the trotskyist movement remained small and isolated, Bookchin started to reconsider his ideas. Bookchin gave up on Marxism, which in his eyes had made a fundamental mistake in seeing the working class as the revolutionary subject, but remained anti-capitalist. It was clear for him that capitalism was a destructive system that had to be abolished. Its weak point, Bookchin reasoned, was not the contradiction capital-labor, but the contradiction capital-ecology. Capital, endlessly accumulating, destroys the environment. The struggle to save the eco-system takes on an anti-capitalist character and can unite everybody who see their lives threatened by the deterioration of the natural environment and who rebel against their alienation from it. To construct an ecologically sustainable society, Bookchin suggested, cities would need to be de-centralized and scaled back to allow people to use renewable energy, grow food locally and cut expenditures of energy on transport. These smaller cities would be governed by assemblies of their populations who would democratically make decisions. Bookchin is often called an anarchist but he did not reject participation in elections and the existing political structures the way many anarchists do. Instead, he favored the combination of social movements and cooperatives that would pre-figure the future society with participation in local city-councils to gain vested, legal political power. This is the strategy the Kurdish movement now seems to be applying with some success in eastern Turkey. In cities and villages where the legal Kurdish party HDP has won enough support in the councils, state-resources are used to facilitate councils and neighborhood associations that are set up by the population in cooperation with various movements and NGO’s. In this way, the movement hopes to build ’democratic autonomy’, the power to locally make decisions in assemblies and councils, while ’evading’ the central, Turkish-chauvinist state. Öcalan and the PKK see this as a way of making citizens actors in exercising self-government. Through strengthening local executive councils and associations of different ethnic, religious, cultural identities and women, pressure is built on the Turkish state to enforce its reform into a democratic republic. The ’old’ PKK of course already built civil organizations of various kinds but the crucial difference is that now these structures, although they are inspired by it, are supposedly autonomous from the party. The PKK, which reverted to its old name after a few name changes in the early 00’s, today states its function is not to be the organizational leadership, but to be the ideological inspiration, a center from which Öcalan’s thought is spread through other structures. This strategy also implies a fundamental shift in the PKK’s use of violence. In the old strategy, the armed struggle was essential to defeat the existing state and capture power. Today, the PKK policy towards violence is designated as ’legitimate self-defense’. Violent actions initiated by PKK-fighters are often retaliation for Turkish violence against the PKK and/or civilian supporters of Kurdish rights and serve to maintain a kind of balance of forces, to show the Turkish state that such repression comes with a price and to prove the PKK still has considerable military potential. The only legitimate violence, the PKK now claims, is this kind of defensive violence. In addition to Bookchin, Öcalan names two other authors as influences, French historian of the longue durée Fernand Braudel and world system theorist Immanuel Wallerstein. Öcalan borrows from them the idea that the development of human society can be seen as moving through various world-eras. The stalinist interpretation of historical materialism is still clearly visible in Öcalan’s recent texts. The familiar list of ’primitive communism – slavery – feudalism – capitalism – socialism’ has been reworked but the idea that history necessarily moves through a progressive sequence of stages is still there. The Sumerian neolithic has replaced primitive communism and the era of ’democratic civilization’, which the world is supposedly moving into, replaces socialism. 7. Whatever happened to socialism ? Rather surprising for somebody who once claimed to be a marxist, there is very little mention of the deep social-economic inequality between the west and east of Turkey or proposals for improving the economic position of the Kurdish population in Öcalan’s recent writings. The themes of class-struggle and class formation, dealt with in clichés in the old documents, have largely disappeared, except as empty labels for Kurdish collaborators and opponents of the PKK as ’feudalists’ or ’petty-bourgeoisie’. A discussion of Kurdistan as a (neo-)colony or victim of exploitation is absent in a book subtitled ’The PKK and the Kurdish Question in the 21st Century’. A few times, the possibility of government development in eastern Turkey is mentioned but no more. The PKK’s socialism became more abstract as it moved from the stalinist idea that socialism means a party-state that owns the means of production to the creation of a new man. What remained consistent during this evolution was the assumption that it is the party that establishes socialism. The working class and its self-emancipation were not issues in the old ideology, even though the PKK paid lip-service to being to a party of the working class. In the early nineties, Öcalan stated that there were no pronounced class divisions in Kurdish society. The real dividing line was between ’collaborators’ and ’patriots’, not between capitalists and working people. Recently, Öcalan insisted the conditions for class-struggle have (still) not developed in Kurdish society. Such a viewpoint seems to contradict the first manifesto and program that declared the revolution should be led by the working class. But by this was meant that it should be under leadership of the PKK, since it is this party that supposedly carried socialist consciousness and impeded it to the people. Heval Zilan put this view like this ; ’Firstly, the army [meaning the PKK guerrilla] is the protector of all the created values. Secondly, it is the carrier of socialist consciousness, which she also passes on through to society. Thirdly it is the army that turns the labor carried out in Kurdistan into value and creates the corresponding consciousness. Fourthly, the army is the basis of the socialist society.’  Since there was, according to the PKK, hardly a proletariat in Kurdistan nor class-struggle, it was the party that needed to create socialism. It is not surprising that as the PKK changed from claiming to be the vanguard to being an ideological center, the emphasis on ’socialism’, whether as a social-economic system or as the name for a society of the New Man, also became less pronounced. The project of ’democratic autonomy’ is based on different identities and the struggle for the free expression of these ideas. ’Worker’ is just one identity among others. Today, Öcalan believes that recognition of democratic rights for all these different identities would bring about the new ’democratic civilization’. He believes the twentieth century saw ’the disappearance of the material foundations of class division’, because of ’technological progress’. But the possibility of a society without class divisions remains unfulfilled because of the state ; ’the state governs the social structure’ and it is the state that ’continues class divisions’. Any discussion of capital is absent. Öcalan does not distinguish between social-economic exploitation that leads to class-divisions and the extra-economic oppression of certain identities. Instead, these are all described as forms of oppression. Perhaps this echoes the reduction of the ’old’ PKK of class-position to the political position one had towards the party. The continuing oppression of certain identities, like the Kurdish one in Turkey, are blamed by Öcalan on state-policies that are lagging behind the development of the new civilization, a development that however is unavoidable because of technological progress. The task then is to pressure the state to allow the realization of the democratic potential that already exists. This in turn would enable in the long term the creation of of some kind of socialism and the realization of the old dream of the disappearance of the state as such. This quote is characteristic of Öcalan’s texts. The confusing language is typical of much of his texts ; ’a model’ that could be ’be interpreted in virtually any way’ but can still be implemented ? The analysis of the collapse of ’real socialism’ echoes liberal idealist ideas that the soviet-bloc collapsed because of its ’totalitarianism’ - a historical and materialist discussion of this development is absent. It is clear from Öcalan’s texts that he sees the Soviet ideology as synonymous with ’marxism’ and is not familiar with the Marxist currents that developed outside of it or the Marxist criticisms of it. Öcalan’s writings are repetitive and long-winded, something that cannot be blamed only on the confines he is subjected to in prison. Öcalan’s texts are immediately recognizable by their meandering style. The juxtaposition of musings on the meaning of ’humanity’ and ’freedom’, with remnants of the old jargon can be quite bewildering. Terms familiar from Marxism are used in ways that imply that for Öcalan their meaning is very different : the ’Second Manifesto’ talks about ’feudal nomads’, the prison writings declare the ’feudal’ Kurdish leaders to be a ’comprador petty-bourgeoisie’. Terms are left undefined and vague. ’Democracy’ for example has become both the goal and method for solving social problems and the defining characteristic of a new civilization. But in hundreds of pages, Öcalan does not offer a sustained explanation of what the word means to him. In brief, it is often unclear what Öcalan is trying to say. The ideology of the PKK has undergone major shifts since its foundation in the late seventies. From its original Marxism-Leninism, that saw the conquest of state-power as liberation, there was a shift to conceiving of ’freedom’ and ’independence’ in personal terms. From a Stalinist conception of socialism as state-ownership of the means of production, there was a shift to seeing socialism as the creation of a new man. From a ’united and independent Kurdistan’ and the formation of a new nation-state, there was a shift to a ’free Kurdistan’ which in one way or another could possibly exist inside the borders of the Turkish state. From seeing women as resource for the revolutionary struggle, there was a shift to seeing women as such as central actors in the movement. One constant throughout the PKK’s evolution is the centrality of Serok Apo and his statements. 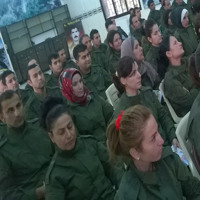 When German activists went to North Kurdistan to ’see for themselves’ how democratic autonomy is implemented, they were repeatedly told that activists were ’following instructions’ of Öcalan, defenders of Kobani claim ’the thought of Apo’ was what enabled them to defeat of IS, his picture is prominently displayed on t-shirts and banners. PYD representatives describe their ideology as ’the ideology of Öcalan’, Kurdish women’s activists say that they have learned everything they know about feminism from Öcalan. The continuation of ideological and political, if not anymore directly organizational, leadership by a single individual is at odds with the claims of self-emancipation of democratic autonomy. The PKK is an confounding case of a movement that supposedly has embraced a vision of ’bottom-up democracy’ on instructions ’from above’. In the ’old’ PKK, gaps in the theory, subjects that were not dealt with or left unclear, were filled with a stock of received ideas from ’Marxist-Leninist’ theories. The writings of Mehmet Can Yüce, one of the movement’s more prominent ideologues from that time, could almost be written by an ideologue of another party from a similar current - as long as they they do not deal with the few topics on which the PKK had developed its own views like the history of the Comintern. The PKK programs and statements from the late seventies and eighties are in many ways interchangeable with those of other Marxist-Leninist national-liberation movements. Now that the PKK defines itself as ’neither Marxist nor anti-Marxist’, this stock of ideas has fallen away and there is less to fill the gaps. The resulting vagueness and incompleteness has its useful sides. The liberal ’conflict monitoring’ NGO International Crisis Group for example has suggested that what they call the ’unbearable vagueness’ of the goal of democratic autonomy is a tactic to make it harder for the Turkish state to ban Kurdish groups for propagating ’separatism’ but this underestimates the changes the PKK and the movement under its hegemony have gone through (it also does not take into account that the Turkish state has no problem banning Kurdish organizations under flimsy pretexts). But the vagueness does make the project open for very wide interpretations. Because of this vagueness, the PKK’s political project can appeal to the sympathy from broad layers. From liberals to anarchists, people can recognize their own desires in it. Even more then when he was the leader of the movement in a direct sense, and in contact with his followers on a daily sense, Öcalan has become a prophet-like figure. And, like with the statements of other prophets, his words are open to interpretation. Activists on the ground have considerable space to maneuver, and to interpret his directives in ways that suit their circumstances. The incompleteness of the new ideology and the relative vagueness of Öcalan’s texts make it possible to adapt it pragmatically to the local situation, while activists can still claim fidelity to ’the ideology of Öcalan’. Decisive for the evolution of the movement is how activists interpret and shape this ideology. The less centralized approach towards building social organizations opens the possibility for a more open and progressive praxis than was possible in the ’old’ PKK. The Kurdish movement has not only maintained itself against the Turkish state but also won concessions from it. A few decades ago, the Turkish state denied there existed something like a ’Kurdish minority’, today it is forced to take the Kurdish movement into account as a political force. This was made possible by immense sacrifices of Kurdish fighters, guerrilla’s and activists. It is them who will decide the future of the movement. Çağlayan, Handan, ‘From Kawa the Blacksmith to Ishtar the Goddess : Gender Constructions in Ideological-Political Discourses of the Kurdish Movement in post-1980 Turkey’, European Journal of Turkish Studies 14 (2012). Online at [http://ejts.revues.org/4657]. 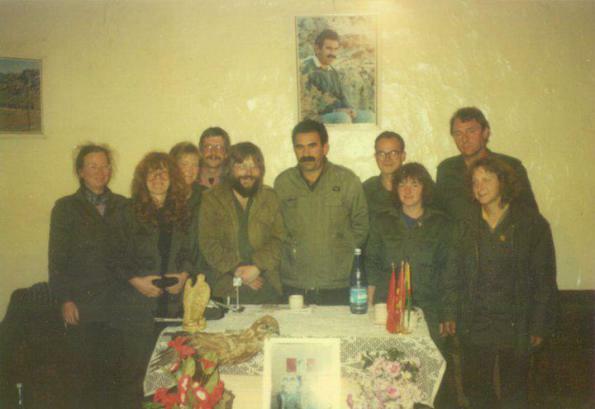 Brauns, Nikolas and Brigitte Kiechle, PKK. Perspektiven des kurdischen Freiheitkampfes : Zwischen Selbsbestimmung, EU und Islam, Stuttgart 2010. Bruinessen, Martin van, ’The nature and uses of violence in the Kurdish conflict’, Paper presented at the international colloquium “Ethnic Construction and Political Violence”, organized by the Fondazione Giangiacomo Feltrinelli, Cortona, July 2-3, 1999. Çelik, Selahattin, Den Berg Ararat versetzen. Die politischen, militärischen, őkonomischen und gesellschaftlichen Dimensionen des aktuellen Kurdischen aufstands, Köln 2002. Flach, Anja, Jiyaneke din – ein anderes Leben, Hamburg 2011. Grojean, Olivier, ’The production of the new man with in the PKK’, European Journal of Turkish Studies (2012). Online at [http://ejts.revues.org/4925]. Marcus, Aliza, Blood and Belief. The PKK and the Kurdish fight for independence, New York 2007. Öcalan, Abdullah, The declaration of Democratic Confederalism, 2005 online at [http://www.kurdmedia.com/article.aspx?id=10174]. Öcalan, Abdullah, Declaration on the Democratic Solution of the Kurdish Question, London 1999. Öcalan, Abdullah, The third domain. Reconstructing liberation. Extracts from the submissions to the ECHR, London 2003. Öcalan, Abdullah, Prison Writings. The PKK and the Kurdish question in the 21st century, London 2011. Öcalan, Abdullah, Der 1. Mai, der Sozialismus un die sich entwickelende Lősung innerhalb der PKK, Hamburg, n.d.
Özcan, Ali Kemal, Turkey’s Kurds. A theoretical analysis of the PKK and Abdullah Öcalan, New York 2006. Schmidinger, Thomas, Krieg und Revolution in Syrisch-Kurdistan. Analysen und Stimmen aus Rojava, Vienna 2014. Yüce, Mehmet, Can, Gedanken űber die Nationale Befreiung und den Sozialismus, Hamburg, n.d.
 Selahattin Çelik, Den Berg Ararat versetzen. Die politischen, militärischen, őkonomischen und gesellschaftlichen Dimensionen des aktuellen Kurdischen aufstands, Köln 2002, p. 37. Quoted in Christopher de Bellaigue, Rebel Land : Among Turkey’s Forgotten Peoples, London 2009. PKK, Programm, Köln 1984, p. 45, 49. Ali Kemal Özcan, Turkey’s Kurds. A theoretical analysis of the PKK and Abdullah Öcalan, New York 2006, p. 86. Özcan, Turkey’s Kurds, p. 89. Martin van Bruinessen, ’Between guerrilla war and political murder : the Workers’ Party of Kurdistan’, Middle East Report (1988) 153 (July – August), 40-42+44-46+50, there p. 46, 50. Bruinessen, ’Between guerrilla war and political murder’, p 40, 41. Martin van Bruinessen, ’The nature and uses of violence in the Kurdish conflict’, Paper presented at the international colloquium “Ethnic Construction and Political Violence”, organized by the Fondazione Giangiacomo Feltrinelli, Cortona, July 2-3, 1999, p. 10. Nikolas Brauns and Brigitte Kiechle, PKK. Perspektiven des kurdischen Freiheitkampfes : Zwischen Selbsbestimmung, EU und Islam, Stuttgart 2010, p. 55. Brauns & Kiechle, PKK, 57. Olivier Grojean, ’The production of the new man within the PKK’, European Journal of Turkish Studies (2012). Online at [http://ejts.revues.org/4925] p. 4. Özcan, Turkey’s Kurds, p. 91. Brauns & Kiechle, PKK, p. 84. PKK, Programm, Utrecht 1995. No page numbers. Brauns & Kiechle, PKK, p. 76. Yüce, Gedanken, p. 79. Emphasis added. Marcus, Blood and belief, p. 291. Brauns & Kiechle, PKK, p. 66. Anja Flach, Jiyaneke din – ein anderes Leben, Hamburg 2011. p. 19. Çelik, Den Berg Ararat versetzen, p. 47. Flach, Jiyaneke din, p. 20. Grojean, ’The production of the new man within the PKK’. p. 9. Handan Çağlayan, ’From Kawa the Blacksmith to Ishtar the Goddess : Gender Constructions in Ideological-Political Discourses of the Kurdish Movement in post-1980 Turkey’, European Journal of Turkish Studies 14 (2012). Online at [http://ejts.revues.org/4657] p. 2. Çağlayan, ’From Kawa the Blacksmith to Ishtar the Goddess’, p. 8. Abdullah Öcalan, ’Jineolojî als Wissenschaft der Frau’, Einleitende Worte der Herausgeberin, oline at [http://www.kurdistan-report.de/index.php/archiv/2014/172/110-jineoloji-als-wissenschaft-der-frau]. Çağlayan, ’From Kawa the Blacksmith to Ishtar the Goddess’, p. 2. Çağlayan, ’From Kawa the Blacksmith to Ishtar the Goddess’, p. 9. Marcus, Blood and belief, p. 244. Çağlayan, ’From Kawa the Blacksmith to Ishtar the Goddess’. p. 13. Brauns & Kiechle, PKK, p. 247. Abdullah Öcalan, Declaration on the Democratic Solution of the Kurdish Question, London 1999. p. 71. Öcalan, Declaration on the Democratic Solution, p. 59. Öcalan, Declaration on the Democratic Solution, p. 17. Marcus, Blood and Belief, p. 248. Brauns & Kiechle, PKK, p. 94. Ahmet Hamdi Akkaya and Joost Jongerden, ’Reassembling the political : the PKK and the project of radical democracy’ , European Journal of Turkish Studies (2012). Online at [http://ejts.revues.org/4615]. p. 6. TATORT Kurdistan, Democratic Autonomy in North Kurdistan. The council movement, gender liberation, and ecology – in practice, Hamburg 2013. p. 53. Hamdi Akkaya & Jongerden, ’Reassembling the political’, p. 6. TATORT Kurdistan, Democratic Autonomy, p. 98. Çelik, Den Berg Ararat versetzen, p. 223 - 224. [Unknown author], Licht am Horizont. Annäherungen an die PKK, n.p. 1996 online at [http://www.nadir.org/nadir/initiativ/isku/hintergrund/Licht/IV-1-3.htm]. Brauns & Kiechle, PKK, p. 82. Öcalan, Prison Writings, p. 50. [Unknown author], Licht am Horizont, online at [http://www.nadir.org/nadir/initiativ/isku/hintergrund/Licht/IV-1-4.htm]. Öcalan, The third domain, .p. 54, 56. Thomas Schmidinger, Krieg und Revolution in Syrisch-Kurdistan. Analysen und Stimmen aus Rojava, Vienna 2014. p. 222, 223. Öcalan, Prison Writings, p. 60. Çağlayan, ’From Kawa the Blacksmith to Ishtar the Goddess’, p.13. The PKK is an confounding case of a movement that supposedly has embraced a vision of ’bottom-up democracy’ on instructions ’from above’. The extent to which the PKK's feminism is dependent on Ocalan's ideas is shown repeatedly in interviews with Kurdish women. For example Henife Husen, co-chair of the Movement for a Democratic Society (TEV-DEM), said: "With the supervision of President Apo [PKK Leader Abdullah Öcalan], Kurdistan's search for freedom came to Rojava, too. The women of Rojava accepted this from the beginning; they opened their homes, they gave up their children to this struggle." And a women's militia commander said: “We don’t want the world to know us only as ‘the women fighting ISIS.’ And we also don’t want people to know us for our weapons. We want them to know us for our ideas. And our ideas are based on the philosophy of Abdullah Öcalan”. "The PKK, supposed to be monolithic, has a long history of dissidence and exclusions: the first fissures inside the central committee showed up with the second congress (1982) and were followed by the first assassinations (Cetin Gunger in 1984, Resul Altinak in 1985). But it was the third congress (1986), in a Bekaa camp, which really marked the beginning of an era of bloody repression comparable, in a way, to the era of the great purges and Stalinist trials of the Soviet Communist Party in 1937. Arrested shortly before the congress, with Kesire Yildirim (Ocalan’s wife) and Duran Kalkan, Selahattin Celik spent three months in a cell where he had to write a report of self-criticism on his “mistakes” before appearing before a “court”. Relieved of his official position, he was sent to Europe. At one time he shared his cell with another member of the central committee, Halil Omer Can, who was severely tortured by his former comrades. Halil Omer Can nevertheless stayed with the PKK until the early 1990’s, when he became one of the three chiefs of the HPP (PKK secret service) in charge of... killing the dissident Mehmet Shener’s partisans regrouped in the “PKK-Refoundation”. In spite of his cooperation with Abdullah Ocalan, Terzi Djemal was finally arrested and executed in 1993. “There were between 50 and 60 executions just after the 1986 congress”, claims Selahattin Celik. “In the end, there was no more room to bury them. Some of them were simple militants, Lebanese Kurds, accused of being “agents”, guilty of “not implementing orders”." In last March 8 in the meeting in Amed in Turkey the letter of Ocalan is read loud to people. This was also debated parallel to what anti_war says in the above comment. But doesn't all this debate related to Ocalan and women's movement is very similar to discussion of veil and feminism? Does wearing a veil automatically makes a women enemy of her gender? Alex De Jong provides a very useful account of the gradual transformation of Ocalan's and the PKK's ideology but in a direction which gives little confidence that a Kurdish based activist social movement might escape that ideology in any genuinely anti-capitalist direction - more trotskyist hope over understanding of material reality in the concluding paragraph. This text is still worth a read but has been passed over in more recent discussion threads. Yeah, only had a quick read of this (it's pretty long) but it seems really good. I think I had an even shorter read and believe its longer than you suggest. Are there any other readers who found this disconcertingly long or short? Or medium? There are no links to obscure websites in this text that are explaining how democratically managed those deserted villages in Rojava, which are now probably PKK military bases!! It does not mention how the houses and lands of Arab peasants who "left" Efrin are "collectivized" and hence there are no classes but only a unified democratic nation either!!! There are no facts in this text! It must be a jewish-Marxist conspiracy to divert real militants away from sacrificing themselves to the cause of democratic-bookchinism and muddle their thoughts with some sort of abstract cosmopolitan idea like class struggle. That made me so mad that I'm gonna write a petition now, and ask some more american bombs to tear all those sunni-arab bodies apart and villages demolished. Viva la eternal storm of steel! Seriously though I could only read the last half and it looks really good. Does anybody know who wrote this? Is it published somewhere else originally? Well I just read it. It also looks good to me. I think it is possibly one of the best peaces that can be written by someone who does not know the languages he try to speak about. There are contradictory statements in People's war section. The guiding principle in choosing its targets was for the PKK however not social antagonism, but the politics of the aghas : whether they opposed the national movement or not. Well does this mean they subordinated aghas (who accepted them) to the party (so working class)? Or other way around they become very nationalistic and privildged the aghas who supported them? I think this could be written more clear. Dozens of these often young, educated volunteers were executed by PKK commanders who mistrusted them or felt that their power was being challenged. And some have references but when I check them I did not think they really mean what the writer imply (though it might be open to debate) ex: "Samuel Huntington"
However it is a good trajectory of evolution of some of the ideas of Ocalan. Though I think it also lefts some interesting other stuff. Maybe it is now time for us to read Ocalan or pkk and not just people's narratives of pkk to get better insight. Maybe it is now time for us to read Ocalan or pkk and not just people's narratives of pkk to get better insight. Hmm, have we finally reached that moment? any suggestions? I'm sure the PKK have a pamphlet in the works, adequately called Fighting for the Nation: Libertarian Statism and the people's struggle. Why not read that if they do? But apart from jokes the narrative and the focus of the above article is obvious, right? The turn in ideology of Ocalan is from materialist to idealist. A classic,very simple story. If we read more first hand accounts we can check it. Moreover article mentions twice the periods of dissolution correctly, but this reminds us to ask how they become so powerful again. The prediction was they will collapse or get smaller in books like Turkey's Kurds (quoted in the article) however they have an unprecedented civil popularity nowadays. Rojava would certainly boost it much more. So a solid analysis of this is needed. Does anybody know who wrote this? Is it published somewhere else originally? "Alex de Jong is editor of Grenzeloos, the journal of the Dutch section of the Fourth International." The PKK did not jettison its old program or embrace its new goals and self-conception through a collective process of deliberation. Instead, party leaders simply carried out the directives of Öcalan. In the 1980s, Öcalan became the undisputed leader of the PKK. The PKK had congresses where its program was decided but Öcalan stood above such mechanisms. He built an organization in which cadres rose to leadership positions by demonstrating their loyalty to him. In the PKK, following Öcalan became synonymous with dedication to the cause of Kurdish liberation. Those who refused to accept this were purged. Other party leaders owed their legitimacy to Öcalan’s approval, and without it they would have lost their position. Even in prison his power remains undiluted. The Kurdish struggle has attracted attention for good reason, and the dedication of its militants in the worst of conditions should not be in doubt. But the much-lauded transformation of the PKK leaves much to be desired. It’s not the clear example of a transition from authoritarian Leninism to libertarian socialism it is often made out to be. Before and after Öcalan’s capture — before and after what the PKK calls the “paradigm-shift” — one essential element of the party remained unchanged: Öcalan is “the leadership” (önderlik). But liberation cannot come from following the twists and turns of a single leader; liberation needs a collective struggle on the back on mass organizations that foreshadow the radical democracy we wish to see in the world.